When people begin to talk about new adventures on their bike, long unexplored routes, or multi day rides, inevitably the term bikepacking comes up. This modified form of bike touring has exploded in the past several years largely due to specialized bikes and equipment designed especially for this type of riding. Bikepacking combines the best aspects of both backpacking and bike touring to give riders the ability to cover varied terrain on their bikes. Bikepacking trips, typically multi-day rides in the backcountry, require specific attention to training and logistics in advance to ensure a fun and successful experience. Although training for a bikepacking trip can be a departure from traditional mountain bike or road training, it’s a great way to mix things up and explore new areas. Being prepared for a bikepacking trip requires you to first think about the ride that you’d like to complete. The terrain, miles covered, and even weather will affect how you prepare for the ride. One of the most important aspects to training for a multi-day bike trip is volume. Day after day of riding, combined with often times challenging terrain, can take its toll on your body. To properly prepare you’ll want to mimic this wear and tear by simulating the stress on your body. Gradually add back-to-back days as well as mileage to each ride to increase muscular endurance and your body’s ability to recover. Unlike training for road and mountain bike racing, the focus should not be on top end speed, but rather maintaining endurance over several days or weeks. Train your body’s aerobic system by staying in zone 2 for the majority of your rides. Traditionally, bikepacking routes cover mountainous terrain, so you’ll want to also develop the leg strength necessary for climbing. Keep in mind that your bike will be weighted, so it’s a good idea to gradually add weight to your bike as you increase your mileage to help your body adapt to carrying the extra weight. The addition of weight will also help you to adjust your riding style, as both climbing and descending are different with the added weight. Your gear will affect the way the bike handles, so it’s important to familiarize yourself with your bike in a variety of conditions. Remain focused on endurance, leg strength, and bike handling for best results. There are hundreds of options when it comes to ways to carry your gear on the bike. A good place to start your trip planning is to decide how you’re going to carry your gear. Deciding between frame bags, seat bags, roll top carriers, and many others depends largely on how much you want to carry and the length of the trip. The primary items that you’ll want to have room for are food, water, shelter, tools/repair kit and clothing. Keep in mind that any weight added to your bike will affect the handling and efficiency of the bike, so lightweight and streamlined packing is ideal. Also, keep your heavy items low and centered on the bike to reduce any negative effects on the handling. As with any type of bike touring there’s a certain amount of planning that must occur to ensure that you’re prepared. A trial run is one of the best ways to prepare for any bike trip. Using the bags, gear, and bike that you’ll be riding on your trip, practice long day-rides and overnight trips to dial everything in. These are great opportunities to fine tune the placement of your gear, figure out what you do and don’t need, and make sure all of your equipment functions properly. After you’ve fine-tuned your gear selection, and have your bike set up the way you want, it’s a good idea to familiarize yourself with the route. Knowing the types of terrain you’ll be covering, whether fire roads or singletrack, will help you adjust your expectations as far as mileage and time on the bike. Often times GPS won’t work in the backcountry so having a paper map of your route is handy. Looking at the map ahead of time will help you mitigate the chance that there are any surprises during the trip. Tackling the logistical challenges and planning necessary for a bikepacking trip is just as important as the training. Take the time to plan properly and integrate pre-rides into your training plan. Once the training and preparation have been taken care of it’s time to go bikepacking. Adjust your expectations regarding average speed and distance, keeping in mind that you’re carrying more weight than normal. Your pace should remain aerobic and conversational. Allow yourself to settle in and enjoy the trip. Nutrition is another aspect of bikepacking trips that may be different than your normal rides. Due to the longer periods of time on the bike with heavier loads, I like to recommend not relying solely on nutrition supplements like gels and bars, but rather packing more substantial foods for fuel. While gels and other supplements can be good for short energy boosts, make time to take on substantial calories to fuel your ride. Often times taking the time to stop and prepare food keeps you fuller longer and helps your body recover from each day’s effort easier. Lastly, it’s important to enjoy the ride. Take time to look around, take pictures, and stop and enjoy the scenery. 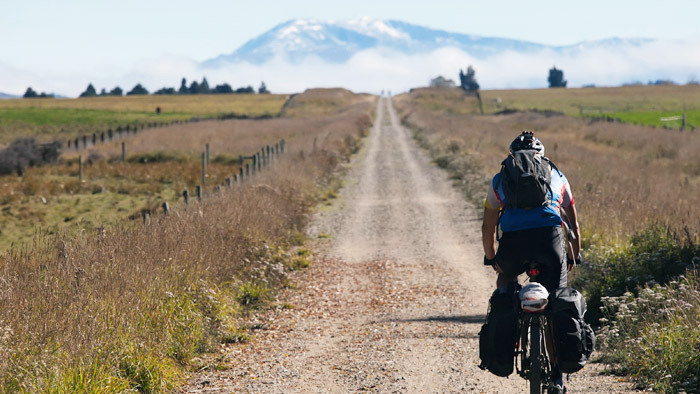 Bikepacking is a wonderful way to combine your love of cycling with the desire to explore. It’s an opportunity to experience the world from your bike seat and enjoy what, for many, is a different cycling experience. With the introduction of bikepacking-specific bikes and components it’s easier than ever to plan a trip. Start by thinking through the ride itself and the terrain that you’re going to cover. Adjust your training by focusing primarily on aerobic workouts. Gradually add weight to your bike to simulate the gear that you’ll be carrying, and build the necessary leg strength to pedal a heavier bike. Make time for trial runs before your trip. These will allow you to fine tune your equipment, and work out any kinks before your big ride. These test runs are also a good opportunity to adjust your nutrition, and figure out what works best regarding fuel for long days in the saddle. Bikepacking trips, while they often include long, tough days, are a chance to ride new places and take in the scenery. By adjusting your training schedule and focusing on a few logistical details, you’ll be ready to tackle your next trip into the backcountry.